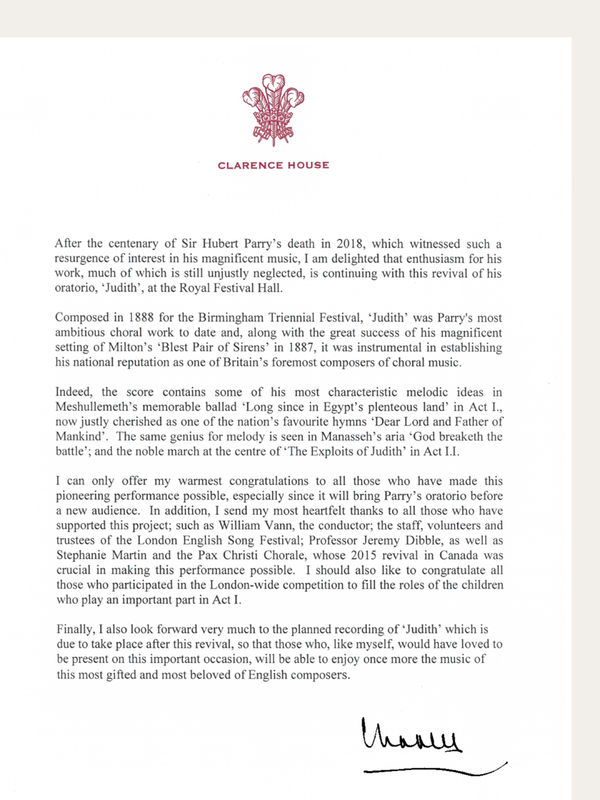 We are delighted that HRH Prince Charles has written to express his enthusiasm for the revival of Sir Hubert Parry’s biblical oratorio, Judith, at the Royal Festival Hall Southbank Centre tomorrow, Wednesday 3 April. Tomorrow’s concert will be one of the most important revivals of English music for many years: a work of considerable stature and quality, Judith has not been performed in the UK since 1922, and not in London since 1889. Parry was the master of large choral and orchestral forces, and Judith features spine-tingling choruses and a dramatic story. Judith was an overwhelming success in Victorian England, performed by some of that era’s greatest musicians. Hans Richter conducted the premiere and Stanford conducted the London debut. It contains the melody that later, under the name Repton, became the famous hymn ‘Dear Lord and Father of Mankind’, but has been largely neglected for the best part of a century and never recorded. If you’ve not yet got your tickets then book them via the link below.